A parent can be assigned to User Story to make the User Story a child User Story of that selected parent. In Edit User Story you may assign that story to a parent. 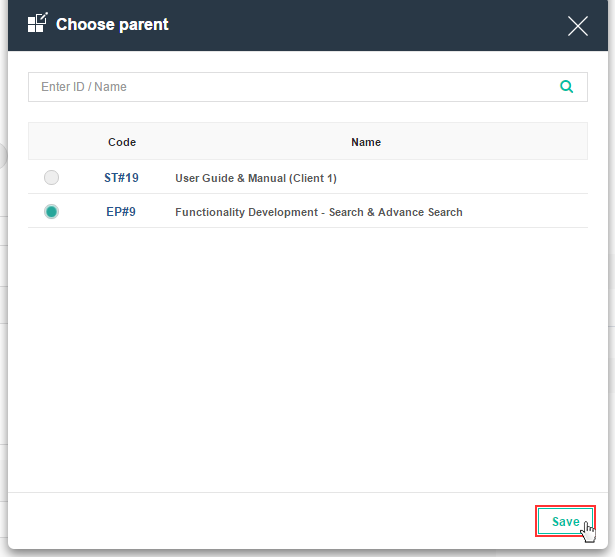 On click of Parent, you will be allowed to select User Story which be selected as a parent. The list will include valid records for parent i.e. Defects and 4th level of User Story will not be included in the list as those User Stories are not eligible to become parent. User Story will display parent child tree structure once parent is added for the story.